After midnight on Wednesday, a petrol bomb was thrown onto the roof of Marievale community leader and former South African National Defence Force (SANDF) sergeant Chris Koitsioeâ€™s home while his wife Gladys was asleep and alone. Koitsoe, who was in Polokwane with the International Commission of Jurists (ICJ) at the time, has consistently opposed SANDFâ€™s eviction and mistreatment of the community. â€œIt was at 1am this morning when I received a call from home. My wife said something was thrown on the roof and it burned like a bomb. She ran outside, she found flames on top of the house. She called the neighbours and they helped her to stop the fire from destroying the entire shack,â€ Koitsoe said in an interview with The Daily Vox. Residents of Marievale have been unlawfully evicted from their homes on an abandoned army base near Nigel (east of Johannesburg), since late November 2017. 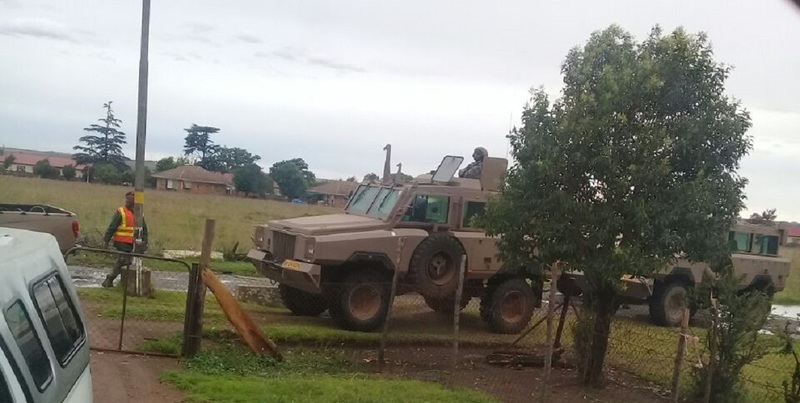 The community has won a number of court orders from the high courts in Johannesburg and Pretoria, ordering the SANDF to vacate Marievale, and condemning their treatment of residents during and after their eviction. The police arrived on scene to assist after the neighbours had put the fire out. â€œWe managed to call the police, the police assisted her. We are waiting on the police to hear about their investigation,â€ Koitsoe said. Police have confirmed that a case has been opened, and that they will be investigating further. The ICJ has, in a statement, condemned â€œthe ongoing violence committed against and intimidation of community members of the Marievale Community Associationâ€. The ICJ is calling on ICJ calls on President Cyril Ramaphosa, as Commander in Chief of the SANDF, the Minister of Defence Nosiviwe Mapisa-Nqakula and Lieutenant General Lindile Yam to condemn the attacks on community member. Itâ€™s calling on the SANDF and public officials to comply with and implement all court orders relating to the Marievale community, ensuring the safe and swift return of community members to their homes. Further, it calls for the authorities to openly and transparently investigate the incident at Koitsioeâ€™s home and bring the perpetrators to justice.